SmartJack® is a high-capacity, fully-adjustable steel pier. Designed to stop settling and can raise your sagging floor back to the proper level. 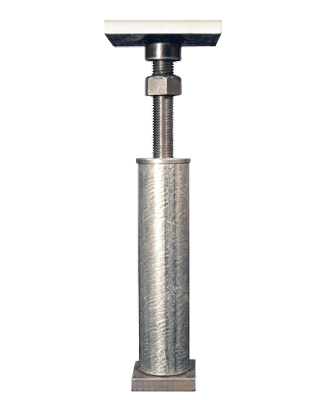 Steel piers can be easily adjusted if future settling occurs. SmartJack® is only available from a certified installer in your area. Contact us to request an inspection & get a free cost estimate to have it installed in your home. A smart fix. 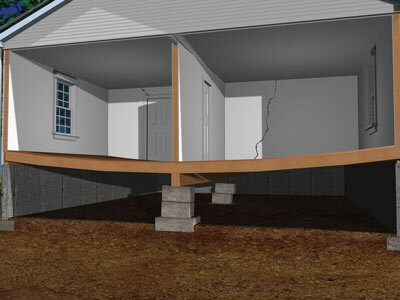 SmartJack® support posts will straighten and strengthen sagging, bouncy floors above a crawl space. Are you bothered by sagging, bouncy floors above a crawl space? This is a common problem. Sagging, bouncy floors indicate a serious structural problem that will worsen over time. These conditions can make floors unsafe, while also causing unsightly cracks in wallboard and beneath baseboard molding. What causes sagging, bouncy floors? Long spans. Floor joists are sometimes undersized for the distance they span and the weight they need to support. Over time, the joists will sag or become bouncy because they’re not “beefy” enough to support the load imposed by people & furniture. Missing mid-span support. 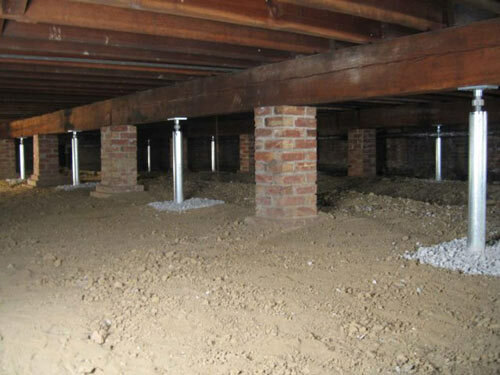 The joists in most crawl spaces are supported by foundation walls AND by a central beam. If the beam is missing, the “long span” problem described above will become evident. Sunken or damaged piers. The central beam that provides mid-span support can’t do its job if it’s not supported properly. Masonry piers sometimes sink, while wood support posts can rot or shift. When piers fail in these ways, the support beam will sag or settle, causing floor joists to do the same. 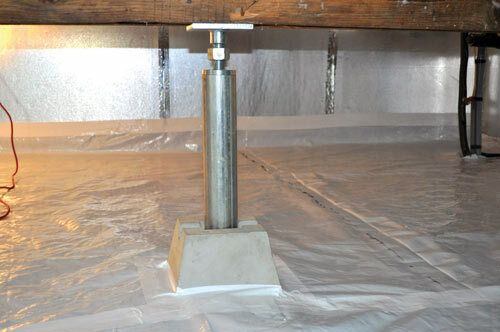 SmartJack® adjustable support posts is an affordable repair solution for the sagging floors above your crawl space. 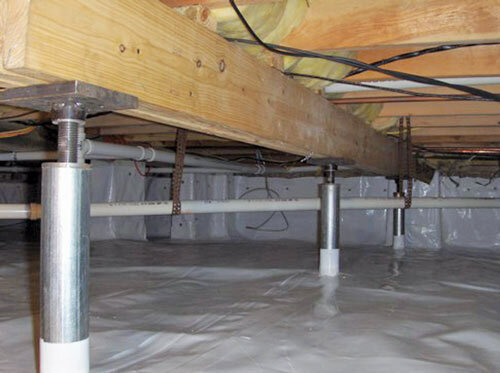 Contact us today to setup a free inspection and estimate for crawl space repair. Drag the arrows left and right . A smart solution. 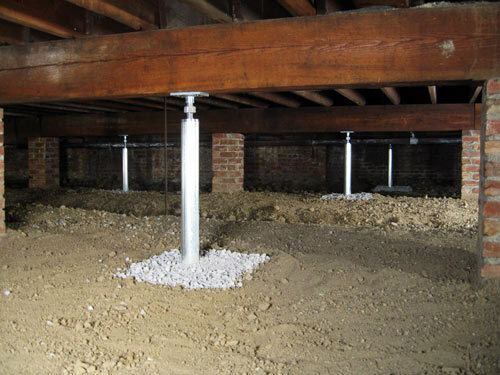 Inadequate support for a crawl space floor is a common problem that can be permanently solved by installing SmartJack® posts. 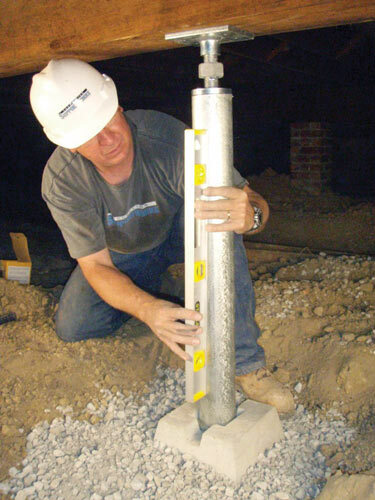 The best way to permanently solve sagging, bouncy floor problems is to install SmartJack® posts beneath the beam that supports your crawl space joists. Each SmartJack® post rests on a precast concrete pad that is set on a base of compacted stone. This engineered structural system won’t settle like masonry piers can; nor will it rot or shift like a wood post. Developed by Supportworks, the steel SmartJack® crawl space piers can be cut to size, based on the height of your crawl space. 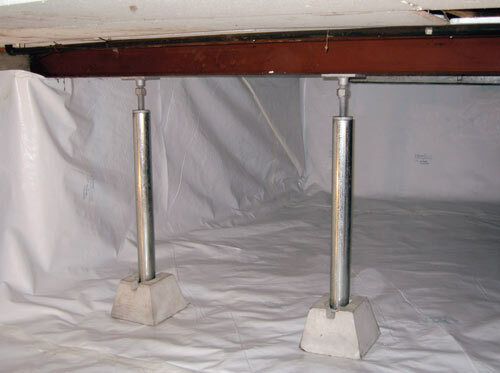 A threaded post cap enables the installer to raise a sagging floor back to its proper level. All SmartJack® parts are protected against rust with a thick galvanized coating. 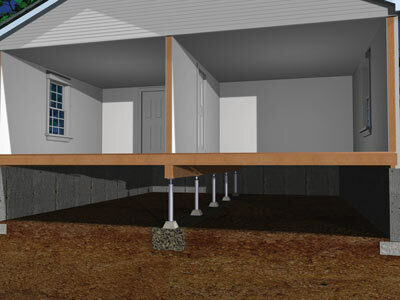 Visit the Supportworks website to learn more about the SmartJack® crawl space support system or check out the other crawl space products available from Basement Systems.